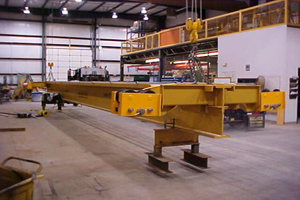 Our company manufactures Single Girder Overhead Cranes in modular construction. These cranes are acknowledged for lifting equipment composed of a hoist mounted on a beam. Our Single Girder Cranes are commonly used for material handling even in small production units and warehouses. 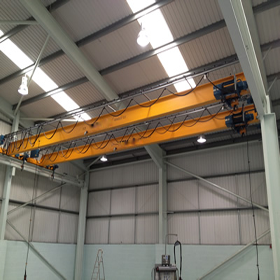 These single girder cranes can be fitted in different floor areas. We are affiancedto proffer our clients high quality Overhead Cranes in short span of time. Single Girder EOT Cranesfinds application in varied industries like Chemical Processing, Chemical Processing, Cement Plants, Paper Mills,Steel Mills, machining workshops etc. These cranes are provided with a hook, magnet or vacuum beams.Single Girder overhead traveling cranes are cost-efficient and lightweight. Due to its compact and lightweight design, these cranes requires less building space and ensures efficient use of the building height. Apart From manufacturing and Supplying Single Girder Overhead Cranes, we also manufacture Jib cranes, Gantry Crane and EOT Cranes.Their noiseless functionality, flawless quality, reliability and low maintenance make the Single Girder Cranes preferred choice amongst our patrons. Wide selection of operating speed.